CPU meter, For those who dont know what a cpu meter is not much point in putting one on your desktop. Weather, yup this is a little icon you can sit on your desktop which shows you the weather forcast for where ever you want it to show. Slide show, little window sits on your Desktop so you can browse your pictures folder without opening the folder up. Calendar, Nice little feature we all need a calander from time to time. Picture puzzle, Just a little toy do not realy need a description it is what it says it is. Currency, Currency converter handy little feature, or it is if your going abroad :) Im not so I have not got one. Windows media center, great just a shortcut realy no need to have it on your desktop. And guess what folks thats just to start :) there are lots more I have only listed what is there and ready for you if you take a look here there are thousands, you could spend ages browsing through them. To access the desktop gadgets you simply click on "Start" then "control panel" then "Desktop Gadgets" you will then see from the screen print below the window that will come up. Simply double left click on the one you like the look of and it will appear on your desktop. If you know longer want it then hover your cursor above it and you will see a little cross appear next to it. 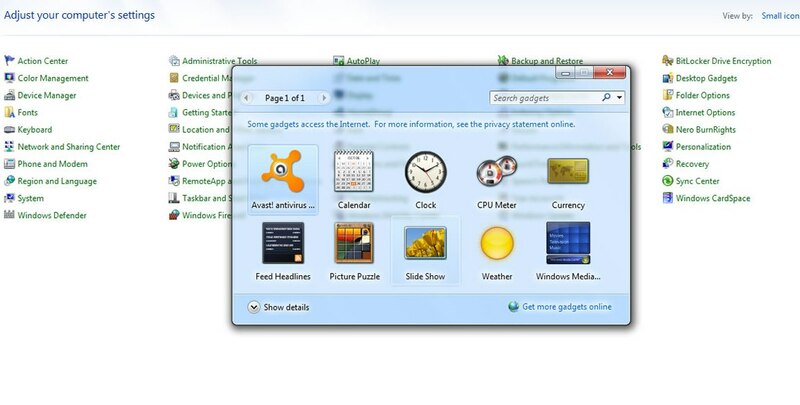 Click on the cross and it will close the application, windows 7 desktop gadgets offers you the chance to download lots more gadgets for your PC. For any more windows 7 tutorials just look here. You can find some examples of what you will find below.